Teamsters president Jim Hoffa makes the case that people in right-to-work states that deny collective bargaining rights to public and private sector workers, have lower pay, a tough time getting health insurance and often lack a safe workplace. 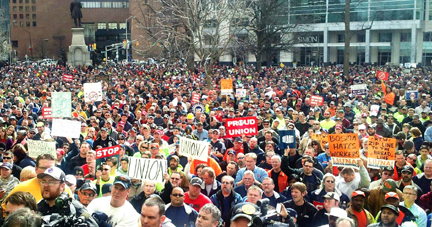 Hoffa writes: “Despite what corporate cronies and groups like ALEC claim, so-called right-to-work doesn’t create an environment that is good for workers or companies. In fact, a recent quality of life report found the bottom five states – Mississippi, Louisiana, Arkansas, Tennessee and Alabama — are right-to-work states. Meanwhile, four out of five with the highest quality of living — New Hampshire, Minnesota, Vermont and Massachusetts — are free bargaining states. 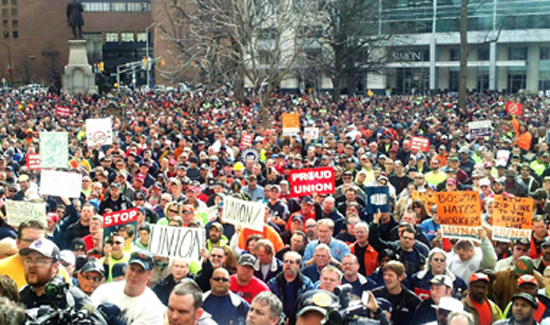 “Right-to-work is a ruse. These laws depress wages, resulting in workers making about $1,500 less than those living in non-RTW states. They are also more likely not to receive health insurance and more likely to work in a dangerous workplace. In addition, it is proven not to be a deciding factor in where businesses locate.